Go north from the Hancock County Courthouse on Hwy 15 for 6.6 miles. Turn right on county road #15. Go 0.3 mile. The cemetery is on the left about 50 feet from the road. The church associated with this cemetery was moved to Mt. Stephens. The first four graves are within a fenced area. A story is told that Gov. Northen was removed from this cemetery to Oakland Cem in Atlanta. If so, this depression may have been where he was buried before being moved. "died in his 64th (?) year" - stone broken at 64. No dates. Kimbrough says it read 64. 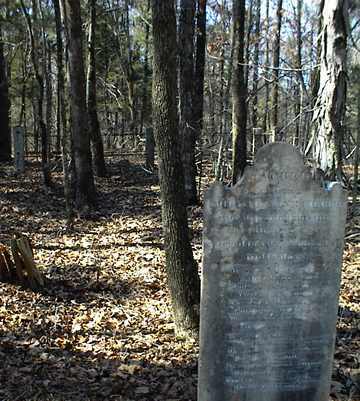 Approximately 102 graves extend from two sides of the fenced area into the woods.